A Comeback! For three years, the Viennese trumpeter Frank Hautzinger hasn't released any CDs. Instead, he worked, obsessed, with his instrument and developed a completely new language. A new tonal color melodics [Klangfarbenmelodik], as hermetic as inviting, just as abstract-because he refers to no scale, no traditional harmonic system (tonal or atonal, it doesn't matter), no conventional approach-as concrete, since he makes elementary things, like streaming air or breathing, present. Gomberg summarizes more than eight hours of solo material into one. The CD originated at various places like New York, Vienna or near the Taj Mahal (India). 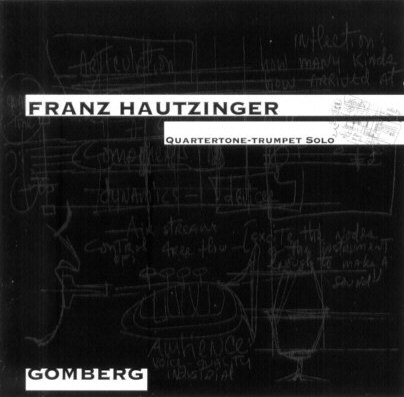 Gomberg is one of the few CDs that feature only solo trumpet. The free jazz trumpet revolutionary from the very beginning, Bill Dixon, partner from Archie Shepp, Cecil Tayor or Tony Oxley, couldn't (therefore) be talked out of writing the 20-page liner notes, an exclusive. Franz Hautzinger lives and writes in Vienna. He's worked with, among others, Werner Dafeldecker, Martin Brandlmeyer (Radian), Steve Noble, Otomo Yoshihide, Helge Hinteregger, Martin Siewert. He heads the groups Dachte Musik (GROB313/4) and the Regenorchester and is a composing member of the Zeitkratzer-Ensemble in Berlin.